RepresentUs Co-founder Josh Silver, Nashville Criminal Court Clerk Howard Gentry Jr. and Friends of The Earth Clean Energy Program Manager Eric Brown. 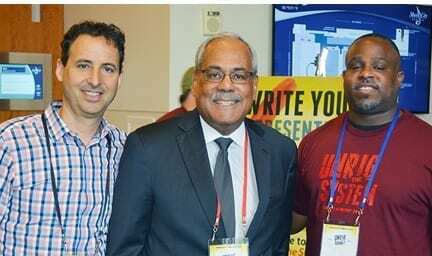 NASHVILLE, TN — According to Joshua Graham Lynn, cofounder of the anticorruption organization RepresentUs, the group’s Unrig the System Summit in Nashville was a big-tent, non-partisan event. Over two thousand came from across the U.S. to America’s largest democracy reform conference to learn, network and be inspired by numerous political activists, reform groups and concerned citizens gathering to fight what they say is the root-cause of political gridlock and injustice in America: big money and corruption. Lynn says this political system serves corruption more than the American people who pay for it. The March 29-31 summit included over 85 workshops, 200-plus speakers, panels and entertainment to encourage participants to share solutions they learned here in their home states. Also at the three-day summit to “learn the issues, build skills and connect with peers” was RepresentUs cofounder Josh Silver. Silver noted major changes happen state by state in the U.S. The historic right to vote for women and marriage equity did not happen because of Washington, but because Americans created that change through education and citizen involvement. Saturday evening, the conference presented Unrigged Live, with entertainment, speeches and presentation of The 2019 Courage Award to Stand Up Nashville Cochair Odessa Kelly. Stand Up Nashville is a coalition of community-based organizations and labor unions that represent the working people of Nashville. Guest speakers included Emma Gonzalez of March for Our Lives, the student-led movement for stronger gun violence prevention. She says the NRA profits from every gun sold.